Is he riding rails or getting air on the half-pipe? The blonde boy skateboarding personalized Christmas ornament features a happy rider with authentic styling crafted from quality, durable resin. We customize these skateboarding ornaments personalized with his name and the year, at your option, in a hand-painted font that differs from the computer font used in the pictures for clarity. A holiday cord makes it easy and quick to display these kids ornaments personalized for the recipient wherever they bring the most smiles. 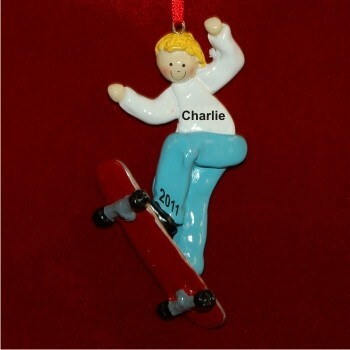 Support his active lifestyle with blonde hair boy skateboarding personalized Christmas ornament that ships in our exclusive velvet gift and storage bag.